Size of this preview: 423 × 600 pixels. Other resolutions: 169 × 240 pixels | 4,928 × 6,985 pixels. 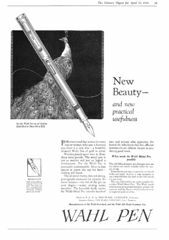 Scansione di una pubblicità Eversharp datata 1924-04-12. Pubblicata su: The Literary Digest. Data visibile direttamente. Pubblicizza le Wahl Engine Turned, denominate Wahl Metal Pen, mostrando un esemplare nella lavorazione Colonial. Ritoccata dall'autore per una migliore nitidezza. Scanning of advertising from Eversharp dated 1924-04-12. Published on: The Literary Digest. Date directly visible. Advertising for the Wahl Engine Turned pens, called Wahl Metal Pen, showing an example in Colonial Pattern. Retouched by the author for a better sharpness. This page was last edited on 11 May 2017, at 17:59.